Big Day of Giving is an online fundraising event that unites the Sacramento region in the spirit of giving to the many nonprofits that provide vital services that help sustain our community. This event is organized by Sacramento Region Community Foundation and its affiliates. 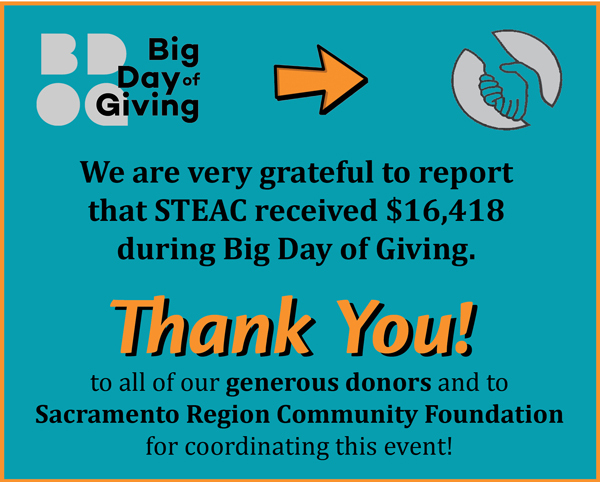 Big Day of Giving donations to STEAC support programs that provide short-term emergency assistance with food, rental, utilities, job readiness and other needs to low income families and individuals in Yolo County.